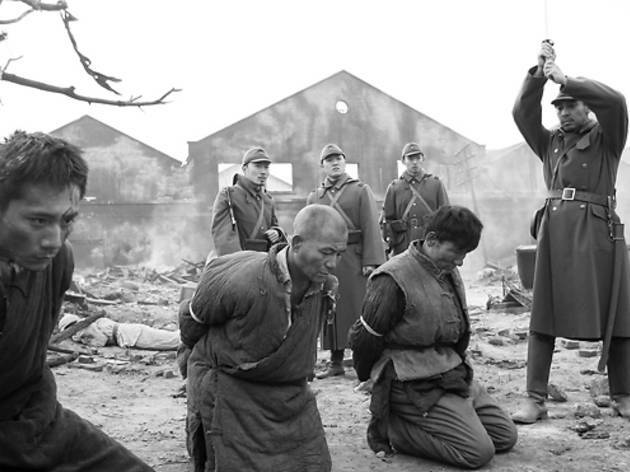 What does it mean that this Chinese-made war film---a sobering depiction of Japan's 1937 three-day siege of Nanking, and its bloody aftermath---has some of the most luscious black-and-white imagery we've seen in ages? Captive women stand silently in dark-as-midnight blindfolds, sunlight gathers in shafts of smoky light, and even a beheading receives the impeccable composition of an Ingmar Bergman art-house thinker. (The work is by gifted cinematographer Cao Yu.) One should remember Schindler's List, and the off-putting way beauty hung in the throat alongside evil. City of Life and Death does a valiant job competing with its own prettiness. Director Lu Chuan (Kekexili: Mountain Patrol), a filmmaker whose career is sharpening into political acuity, has spent years fighting censors for his movie's integrity. Lu has even managed to accommodate the sensitive perspective of a torn Japanese officer (Nakaizumi), which, given the horror this episode still carries in Chinese memory, would be like showing New Yorkers a conflicted Osama Bin Laden on the eve of 9/11. The movie skips along episodically; it's not quite as sharp as a war narrative needs to be, even if its nightmarish psychology feels spot-on.